Hindoostan, Farther India, China, Tibet. 1 : 17500000 Mitchell, Samuel Augustus Jr.
1 : 18000000 Mitchell, Samuel Augustus Jr.
India & Farther India - political. 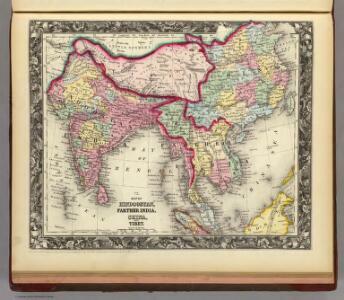 1 : 10000000 John Bartholomew & Co.
Composite: Carte Generale des Indies. 1 : 10200000 Johnson, A.J. 1 : 22000000 Reichard, C. G.
1 : 14630000 Johnson, A.J. An accurate map of Hindostan or India, from the best authorities. 1 : 10300000 Picquet, C.
1 : 12400000 Montemont, A.